Years ago, if you asked someone to name the biggest meteorological threat facing California, they would probably have answered “earthquakes” without a second thought. In recent years, however, two closely-related threats have risen to the top of the list – drought and wildfire. Given the “wild” moniker, many people assume that they have little or no legal rights when a wildfire causes damage, injury, or loss of life. This is not necessarily true and our California wildfire attorney helps ensure that wildfire injury victims recover money from insurers and, when there is a human cause, from those responsible for the blaze. 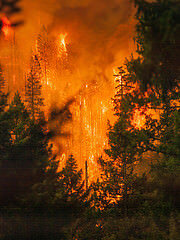 On Monday, San Jose Mercury News reported on a wildfire that is roaring through parts of Northern California. 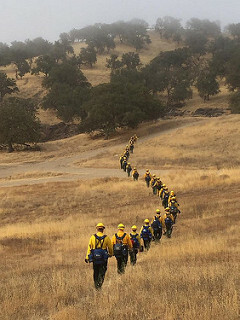 The Lower Lake Fire, broke out on Saturday and quickly grew to cover 5 square miles, aided by winds, bone-dry vegetation, and soaring temperatures that hindered firefighters’ efforts. After seeming to calm later Saturday, wind gusts kicked up flames again on Sunday and the fire tore into parts of Lower Lake, a town of 1,200 located some 90 miles north of San Francisco. Fire officials compared the blaze to a wave of water pouring over the city. More than 100 homes were destroyed over the weekend and Cal Fire said thousands remain in the threat zone. The fire is doubly tragic because it hit an area that is still recovering from a major fire just one year ago. One of the structures that burned over the weekend was the Habitat for Humanity office that had been working to raise funds to rebuild homes destroyed in last year’s blaze. The Lower Lake Fire is just one of 11 large fires currently burning in California that have been fueled, in large part, by the drought-stricken landscape. As the Mercury News notes, a wildfire near Lake Nacimiento in Central California grew from 2 miles to nearly 7 miles on Sunday as it shifted northward leading authorities to evacuate some residents by boat. The very word “wildfire” leads many to assume that they are all acts of nature and that people therefore have no legal claims when a wildfire causes property damage, injury, or even death. This is, however, not necessarily correct. For the purposes of this piece, we will look at two types of wildfire lawsuits – Suits against the parties responsible for the fire and Suits against insurance companies who deny proper claims. Some wildfires are caused by an act of nature, such as a lightning strike. Other wildfires can be traced back to a human cause. For example, lawsuits were filed in the wake of last year’s deadly Butte Fire blaming the deadly blaze on an overgrown tree that hit a power line. These include a wrongful death claim (NBC Bay Area), a suit on behalf of other individual fire victims (Fox 40), and claims filed by the state of California looking to recover some of the $90 million in firefighting costs (KRON). Other human acts that may lead to the outbreak of a wildfire include a tossed cigarette, a campfire built in a restricted zone, improperly stored flammable materials, or a faulty piece of equipment that erupts sending embers into a neighboring field. Our firm works with top-notch experts to determine and prove the cause of such blazes. Also, as with residential fires, it may be possible to bring suit against a part that exacerbated the fire in a way that led to injury. For example, if a wildfire invaded a rental home that lacked working smoke detectors and someone died because they did not hear a warning signal, the owner/landlord may bear some legal responsibility. A second group of wildfire lawsuits are those involving insurance companies. Insurance companies are more than happy to accept our premium payments, but far too many of them fight genuine claims. In some cases, it may be necessary for a home/business to be treated to remove dangerous microscopic particles that can cause serious respiratory problems. As residents of California, we share our community’s concerns and fears regarding wildfires. We represent people injured in wildfires caused by human negligence or wrongdoing (including negligence/wrongdoing by corporations or other entities). We also represent people in disputes with their insurance carriers. Call our wildfire lawyer in Santa Rosa, Oakland, or San Francisco at (800) 427-7020 to learn more about how our team can help. We serve all of Northern California and much of Central California. We urge everyone to exercise caution and follow the instructions of emergency officials during wildfire season. Stay safe.